CD reviews: "Search for the Golden Dreydl," "Psycho-Semitic," "Eat" and "Crazy Flower: A Collection"
If you want to hear the wildest, most avant-garde sounds on the scene today, jazz might not be the automatic destination it once was. Some of the most richly experimental improvisation going on these days can be found in the ongoing Jewish renaissance. Initiated a decade ago on the East Coast by a revived interest in the klezmer music of pre-Holocaust Eastern Europe, the Jewish renaissance is now melding improvisational jazz to traditional melodies, structures and instrumentation  and swinging like hell. Like jazz' kissing cousin blues, Jewish music lends itself naturally to improvisation  much of Jewish folk is constructed with a main theme that is repeated in each verse; those verses can then be handed over to the soloists to work their magic on. And as with blues, instrumental virtuosity is highly esteemed in the Jewish tradition  you better be able to play before you get up on stage. Naftule's Dream is one of the most adventuresome of the new Jewish groups on the scene; the band comes across as what you might hear were Ornette Coleman to play a Jewish wedding. On their new album, clarinetist Glenn Dickson leads Naftule's Dream through some of the tightest ensemble improvisation this side of Henry Threadgill's combos. The band also uses dissonance and free (non-thematic) improvisation quite a bit, giving this release a very strong feeling of jazz. At the same time, the makeup of the band  clarinet, trombone, piano, guitar, tuba, drums  keep the sound firmly in the Jewish firmament. 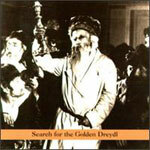 "Search for the Golden Dreydl" starts off as a typical Jewish album with Dickson's "Black Prelude," a traditional-sounding song with his clarinet on lead. The thing is so straight it could have come off one of those "music for bar mitzvah" LPs from the '60s. But on the second cut, the band takes a true traditional  "Oy Tate"  and after a conventional opening progressively wraps an increasingly dissonant jazz approach around each successive verse, leading to a rousing group improvisation before tying it all up back in conventional form. Which sets a certain pattern for "Search"  open the song in straight fashion, deconstruct and reconstruct it, put it back together. And it's wonderful stuff, every song. The band members exhibit a deep knowledge and appreciation of both the jazz and Jewish repertoires  there's a definite electric Miles influence on "The Unseen" (written by Dickson), which also has guitarist Pete Fitzpatrick sounding like Blood Ulmer. A close listen to the rest of the album reveals other equally divergent influences  but why spoil it for you? If Naftule's Dream is Ornette at a Jewish wedding, then Hasidic New Wave is Threadgill in a yarmulke. Frank London and Greg Wall, the co-leaders of HNW, are even more out there. Adding avant-jazz guitarist David Fiuczynski certainly doesn't do anything to rein things in. "Psycho-Semitic" is so experimental, so free-form, that at times you will have as much luck finding specific Jewish influences to peg this with as you would finding original African influences in Sun Ra's music. The album is set up with each song following a short musical representation of one of seven blessings from the high priest  one has to go back to the biblical days of the temple in Jerusalem to find priests in the Jewish faith, so this is real old-time religion. The songs are a mixture of traditional Hasidic songs and original compositions. (Of course, even the traditional songs are performed in a shape such that no rebbe would ever recognize them.) Other than that, there's not much of a theme here  excepting outstanding players. Fiuczynski's "Habibi" is a weird but workable combo of early King Crimson and Sonny Rollins; saxophonist Wall's "Blues in Exile" has the frenetic pace of Tony Williams' Lifetime band of the early '70s. If the link between traditional Jewish music was more tenuous with Hasidic New Wave than Naftule's Dream, then the Bay Area's Charming Hostess stretches it even further. In fact, the music of Charming Hostess is, at least in terms of song credits, equal parts Bulgarian and Jewish, with a dash of rock and American gospel. And rather than the influence of jazz, as Naftule's Dream and Hasidic New Wave have, Charming Hostess is more a melding of alternative rock and Eastern European folk. Which is not only musically rewarding and kind of neat, it's reminiscent of the scene 30 years ago when bands like Fairport Convention and Steeleye Span were taking traditional British, Scottish and Irish folk and performing it in a rock environment. The Pogues did the same during the punk movement, and it's nice to see there are others still interested in exploring the continuity and history of music. So what exactly is here? In terms of the songs, we have "Mi Nuera" which is a medley of three traditional Jewish wedding songs from Spanish Morocco, and "Mi Dumandas," a Jewish song from Turkey. We have "Dali Tzerni" from Bulgaria and "Give Him a Little Time" from Hungary. And then there are "When Jesus Was Here on Earth," a white gospel song, "Oh Julie," an African-American work song, and the Residents' "Won't You Keep Us Working." In terms of style, you'll find shades of Her Majesty the Baby and Kate Bush  with a strong, strong dose of the Roches. As with the Roches, Charming Hostess has three women sharing the lead vocals and harmonizing at the same time. But Charming Hostess has a harder edge to them than the Roches' folksy approach; in terms of style, they're closer to Her Majesty the Baby. Oh, and all three singers  Jewlia Eisenberg, Carla Kihlstedt and Nina Rolle, have rich, beautiful voices like Bush or Jane Siberry. One last comparison: In its wide-ranging ability to play a variety of different styles with authority and swing, the instrumentalists in the band come closer to Brave Combo than anyone else. It's really quite impossible to put any kind of label on the music of Charming Hostess  the Jewish tag is as good as any. If you like any of the bands held up as comparisons above, though, you're likely to dig Charming Hostess as well. Where the other three bands are more influenced by the Eastern European Jewish traditions, Alberstein lives and works in Israel  her music is much more Middle Eastern than the others reviewed here. 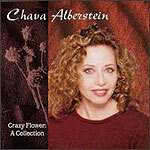 And she sings exclusively in Hebrew, rather than in Yiddish. Still, as Alberstein herself points out in a short liner note, she grew up listening to her mother singing in Yiddish, Polish and Russian, so those influences are present. There's another influence at work here, too -- the salon singers of mid-century France whom Alberstein credits as her teachers. You don't have to understand a word of Hebrew to hear Edith Piaf in Alberstein's delivery. And that's the beauty of this album: Like Piaf or Sinatra or Ella or the great singers of Argentinean tango or Portuguese fado, Alberstein sings with sophistication and sass, speaking to those eternal truths of love and heartbreak, of possibility and romance. Yes, the lyric sheet is in English for us gentiles, but Alberstein's inflection and delivery communicate just as much as the words.